Something a little different for today. I saw this tag on Yessigray’s Blog, and decided to jump on the bandwagon. Tag. Books. I’m game. 1. You have 20,000 books on your TBR. How in the world do you decide what to read next? Since this is pretty much an accurate representation of my reading life, I will let you in on a little secret: I read whatever I like, whenever I like. I do not have a monthly TBR as so many other book-bloggers do: I find them restricting and generally unhelpful. I nearly always have multiple books on the go, so I jump between them to keep myself entertained (my number of ‘currently reading’ books stands at four at present). I generally try to keep the number of books I am reading at any one time below five, but I have few issues with jumping into a new book if my current reads are not grabbing my attention. In short, I read whatever I feel like reading at any particular time! 2. You’re halfway through a book and you’re just not loving it. Do you quit or commit? If I am not loving a book (as it currently the case with “A Clash of Kings” by George R.R. Martin) I pick up something else to occupy my interest. I will however always go back to the book, because I have a policy that I have to finish every book I start, no matter how long it takes. I’ve yet to quit on a book (except school books, but I don’t count those, as it wasn’t my choice to pick them up in the first place). Plus, if I quit, it can’t go towards my Goodreads challenge. 4. The cover of a series you love do not match. How do you cope? I don’t. My OCD does not approve of publishers doing this. In fact I tend to have to re-buy the entire series so my covers match. I also hate having a mix of hardcover and paperback books within a series. If a series I love is re-jacketed later on (when all the books are out), I sometimes purchase the different covers as well as my original ones. 5. Everyone and their mother love a book you really don’t like. Who do you bond with over shared feelings? The internet. There’s bound to be someone out there who shares my woes. Twitter is a great tool for finding like minded people, and there are always people on Goodreads who hold unpopular opinions about books. Alternatively, there is always my Granny. We tend to share the same loves/hates regarding books, and she’s always happy to devour any novel I give her. 6. You’re reading a book and you’re about to start crying in public. How do you deal? It takes a lot for a book to make me cry, but I just go with it if a book gets me emotional. I was a wreak reading “Marley and Me”, but thankfully I only had to contend with my family and not the public. I tend to avoid books that are likely to give me ‘the feels’ when I’m out and about, and instead stick with safer options, just in case. 7. A sequel of a book you love just came out, but you’ve forgotten a lot from the previous novel. Will you reread the book? Skip the sequel? Try to find a synopsis on Goodreads? Cry in frustration? If I loved the book, it’s highly unlikely I’ve forgotten the synopsis. I do have an extremely good memory for books (which is a necessity when you read multiple books at a time). If I enjoyed the book but can’t remember the finer details of the book, I may well have a flick through a few Goodreads reviews (looking specifically for the spoilers), or alternatively I’ll just read the Wikipedia page on the novel, which are usually extremely accurate. I’m never going to skip the sequel of a book I loved, come on! 8. You do not want anyone borrowing your books. How do you politely tell people nope when they ask? “Sorry, I don’t lend out my books.” That’s all there is to it. If it’s a book I didn’t particularly enjoy, I might just give them the book to keep, but I never get books back in the same condition as I lent them out in, so as a rule of thumb, I just don’t do it. I do giveaway books though, especially if I have multiple copies of it, or I buy people books for presents (particularly if they have been asking to read a book or a series). I do not lend books out beyond my immediate family (and my Granny), because I’d probably never get them back! 9. You’ve picked up and put down 5 books in the last month. How do you get over your reading slump? I might listen to an audiobook on Audible.co.uk (which I have a subscription for). Alternatively I’ll pick up a short (probably children’s) book, which I can read in one sitting. If I just don’t really feel like reading, I won’t push it, I’ll do something else instead like watch a movie or binge watch a TV series. Generally my reading slumps don’t last more than a couple of weeks. 11. 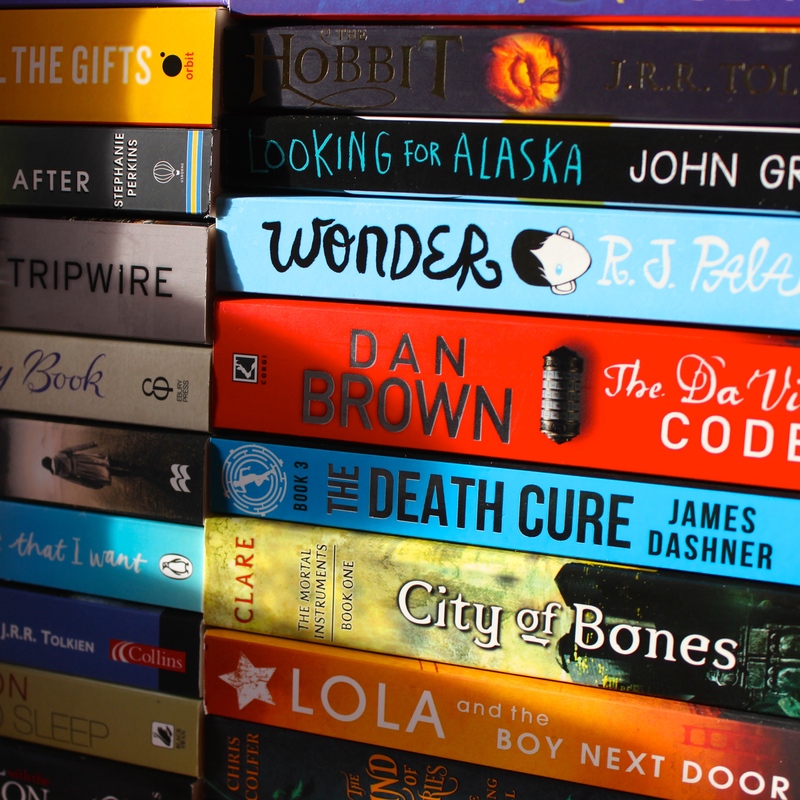 After you’ve bought the new books you can’t wait to get to, how long do they sit on your shelf before you read them? Usually a long time. I love to admire my books, and I’m generally in no rush to read them. The exception to the rule is if I am meeting an author of a new release in the near future, in which case I prioritise their new novel over all others. Part of the reason I buy new releases is so that I have 1st editions, so I view it as an investment rather than a waste of money. It’s really rare that I’ll go into a bookstore, buy a book and read it immediately.